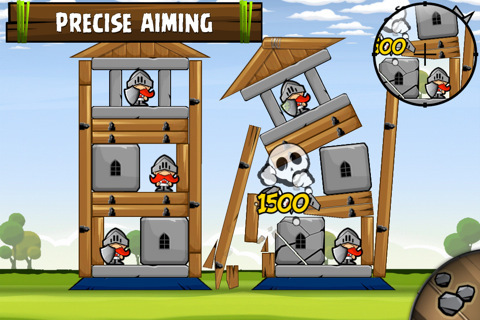 Siege Hero is an action puzzler game for the iPhone and iPod touch. If These Heroes Seem Tall it is Because They Stand on the Shoulders of Angry Birds. Siege Hero is a lot like Angry Birds, except the view is changed to first-person and the characters are less adorable. In my opinion that’s already more than you need to know (they’re really only slightly less adorable), but nobody respects a sentence long review so if that seems a little oversimplified I’ll gladly elaborate. 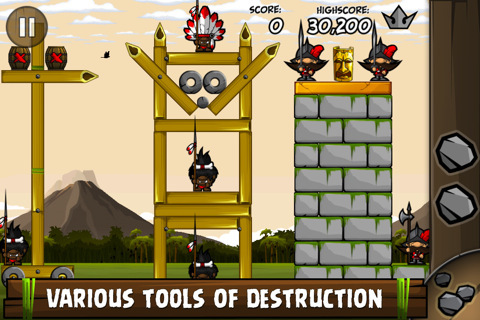 Now before some of you more tempered iOS users go off and start correcting me let me assure you that I am well aware of Siege Hero’s predecessor Crush The Castle, which Angry Birds borrowed many elements from, but nowadays the avian students have become the angry masters. In turn Siege Hero has managed to take more than a few pages out of Birds’ book while still adding a bit of new flare to keep things fresh. The first person view is the most prominent addition, as you take your vantage point right behind the cannon to orchestrate the destruction of your foes. Perhaps the most brilliant feature is adding innocent villagers to the mix as the levels progress, creating the possibility of bonus points if you can figure out how to vanquish your mustachioed enemies while leaving the innocent unscathed. On second thought the giant mustaches might be the most brilliant feature. New ammunition gets introduced as you progress, keeping you engaged as you figure out new ways to demolish the levels. There is also a great feature which allows you to have a small zoomed in crosshair view for more precise aim, which especially comes in handy on the smaller screens of the iPhone and iPod touch. One major drawback in Siege Hero is the decline in difficulty in comparison to Birds. With the first-person view there is no way of assigning a distance to your volleys, which means you merely tap the screen for where you want to shoot. The added challenge of keeping the innocent villagers alive does partially make up for this, but in general the game is a little less challenging in comparison. The stage selection and menu screen are nearly identical to Angry Birds, as are the structures and physics of the levels. Not to say the game takes itself too seriously, although the colors, themes, and music are also a bit darker and more epic. Like I said, my first statement should still be your main concern. If you feel like you’ve thoroughly exhausted yourself with Angry Birds and its many seasonal sequels then the Siege Hero game may not be for you. If a new twist on what is already a classic game sounds up your alley then Siege Hero is definitely something worth looking into. AppSafari review of Siege Hero was written by Neema Akhtar on September 2nd, 2011 and categorized under Action, App Store, Fun, Games, Physics Based, Puzzler. Page viewed 4559 times, 2 so far today. Need help on using these apps? Please read the Help Page.